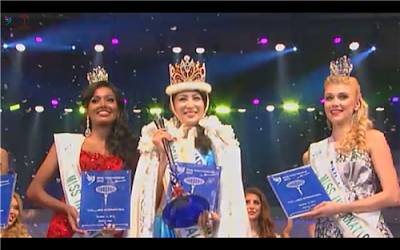 The Miss World 2012 production barely holds onto the A- grade that the 2011 show also got. I did not enjoy the show on the final night as much, probably mostly because of streaming issues! (I wish they would stream it live on the pageant's website again!) I could just also not force myself to watch it again until after the USA won Miss Universe because I was not too happy with the results. When I did actually watch it again, I found that it was not bad at all but the producers still need to freshen the whole thing up. I love the cultural elements of the show. That is something most fans miss about modern day pageants. Miss World 2012 was one big, long commercial for Ordos but it was done in a very clever way. The cultural elements that were included in the show actually just helped to cater for a visual feast for the viewers' eyes. That was very well done. A highlight of the 2012 pageant was that the top 15 got to walk on stage in a mini-parade which is something the fans have been demanding for quite some time. It was brief but it was a step in the right direction. Unfortunately there were some glitches too and the show still needs to be freshened up so that it does not feel like a 2 hour results show. Sloppy camera work can't be excused - they were in Ordos for a month. Everything should have been perfect. The incident that happened between Malawi and New Zealand should also not have happened at all. Yes, it's live television but these girls rehearsed over and over again. It's also really time for a new way to introduce the girls. It's such a rushed mess. The inserts should be condensed. It's supposed to be a live show. We don't just want to see 1 hour of inserts and a few moments on stage. The roommates talking in the top 7 round should just be cut. It never works out. They always start and then they have to stop it half way through. The leaderboard was a huge mess and that was really embarrassing for the organization. Overall, the wonderful cultural elements and beautiful stage made this show hold on to it's A- of the year before! The producers have a lot of work to do and I hope they freshen up the pageant even more this year. The Christmas themed Miss Universe 2012 was one of my least favorite editions of Miss Universe in recent years. Once again, maybe it's because the results seemed really odd. However, something that rarely happened in NBC Miss Universe telecasts was witnessed during the 2012 pageant: technical glitches. There was a problem with the voice recordings for the introduction which meant several delegates were robbed of their introductions. The camera work was also quite messy and the way the delegates came from different parts of the stage was just a bad idea. It looked messy and it was definitely not easy on the eye. I felt a bit seasick at times. I get that they wanted to make a big deal out of the fact that Miss Universe was being held in December for the first time. But they went a bit too far with all the Christmas decorations and all the other holiday themed touches. It bordered on tacky. If Miss Universe is held in December again, I really hope that we don't see any of that again. One thing that can't be denied is that the production is still good in general. They had great hosts and two sleek rounds of competition. The swimsuit round was high energy - past paced with cool music. It's always same old, same old... but somehow they make it feel fresh every year. In my opinion, Train was not the right fit for the evening gown round and I could have gone without the girls falling around on stage but the actual evening gown competition was sleek. The highlight of the whole show was the cool final look segment that they started last year. They always choose a great song and they do it really nicely. 5 hours!!!!! 5 looooonnnnnggggg hours. It was almost pageant torture. Miss International has never been known for it's amazing telecasts (with an exception or two) but last year's edition was just a nightmare. It was so slow-paced and it felt frustrating to see the hosts try and scramble to make it run smoothly. It's almost as if they were also relieved when the winner was finally crowned. Having all 69 delegates compete on stage might make their pageant unique but it was so slow-paced and boring that it was not fun to watch at all. And you had to do it twice. The inserts were also really sleepy and the whole production just lacked energy. Miss International is clearly facing tough times. They are banking on their history but they need to inject some life into this pageant. Not even die hard fans want to watch an international event that's not even on par with a lot of national finals. The MIO/Japanese Culture Association should take steps to save their pageant. It's not too late yet. Get some young people with creative ideas involved if you want to save the whole thing! Miss Earth 2012 was also a mess. Two years ago they had quite a good show in Vietnam only to be followed by a terrible telecast the following year. 2012 had potential but the venue that was selected turned it into a hot mess. The wind was blowing like crazy and it was annoying to see the girls trying to pull the hair out of their faces and mouths and try and keep their gowns from blowing up. Having the pageant happened all over a "mansion" was also not a good idea. It was just so messy and disorganized. It gave me a migraine. I liked the cool runway on stage but it was obviously really slippery. The swimsuit competition was my favorite part of the competition. From the beginning to the end: the windblown mess just felt disorganized and improvised. It was almost embarrassing to watch it. I thought they had accidentally recorded the rehearsals for the introduction and was showing it instead of the actual pageant and the awkward way in which it started pretty much continued right until the end when the crowning was a mess. It was quite clear that they couldn't find the crowns and there was confusion and people running across the stage. I was relieved when it was over. Thank goodness for a great winner. Miss Earth also needs to take a step back and look at their production. They have a pretty decent show but they need to hire a great production team and a competent producer. After last year's rigging allegations, they need a stellar show this year. The world is raising their eyebrows - time to regain some credibility. Miss Earth 2012 was the worst ever pageant I have ever watched in a thousand years!!!!!! they have done it for more than 10 years and still they have not learnt anything from their past mistakes!!! A very strange Top 4. it was like a repeat from past years' editions. It was a real relieve when it was over.